Confession: I love organizers, day planners, calendars, journals, post-it notes, you name it. If it has a place to jot down events, plans, ideas, notes, I’m all for it. That being said, I have yet to find the “perfect” planner. I have used the Franklin System, Day Runner, the plain old pocket calendar, my phone calendar/list system, my computer, a college comp book, and many others all in search of a system that will help me get my stuff done! In my search for the “perfect” planner, I’ve discovered that I suffer from what I like to call the “Goldilocks syndrome”. I’m looking for a planner that is “just right”. One that allows me to see my schedule from a global perspective (year at a glance) as well as at the microscopic level (each hour), one that helps me to remember every snippet of info that I need to remember, one that reminds me to clean/exercise/cook/(insert activity), one that keeps track of my spending and tells me when I need to reign the dollars in, one that cleans my car and washes my dogs and mows the lawn… Wait I just slipped into fantasy land there! As you can tell, I’m searching for something that doesn’t exist. The truth is any system will work. Some are better than others, and it is important that you find one that meets your particular needs, but it’s the operator that needs to work the system to achieve the results. Writing stuff down doesn’t get it done. Doing it gets it done. I know this is elementary, but it’s also been a revolutionary thought for me. Too often the activity of “writing down the task” felt very much like “doing the task” when it reality all I did was write it down. So in my Committing to Change, I’m actually going to use my organizer as a system that moves me to finishing projects rather than having it be the project. That being said, I have landed on a planner that I created myself and that seems to encompass my particular needs right now. This could change next week, but here it is for now. And the secret to all this is actually “doing the stuff that’s written down”. Of course it’s covered with dog-themed scrapbook paper! It’s 5 1/2 X 8 1/2, spiral bound and fits nicely into my purse. 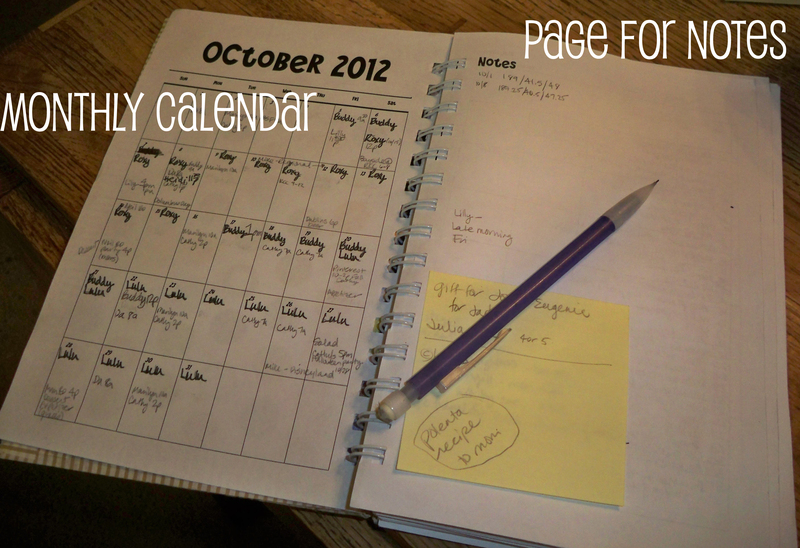 It has a monthly calendar (through Dec, 2014) and a page for notes. Following the notes, I have a page for each week of the month that is broken out by the days, Sunday through Saturday. I have space to write out appointments/tasks for each day (Daily Plan), our dinner menu (Menu) and a spot to write down if I spent any money that day ($$$ Spent That Day). At the bottom of the page, I have listed the areas of my house that get attention on each particular day. It’s the central hub of all our activity and it’s great to have it all in one place. I am notorious for keeping information in a variety of places and then forgetting where it is. Having one “go to” spot has reduced that stress immensely. 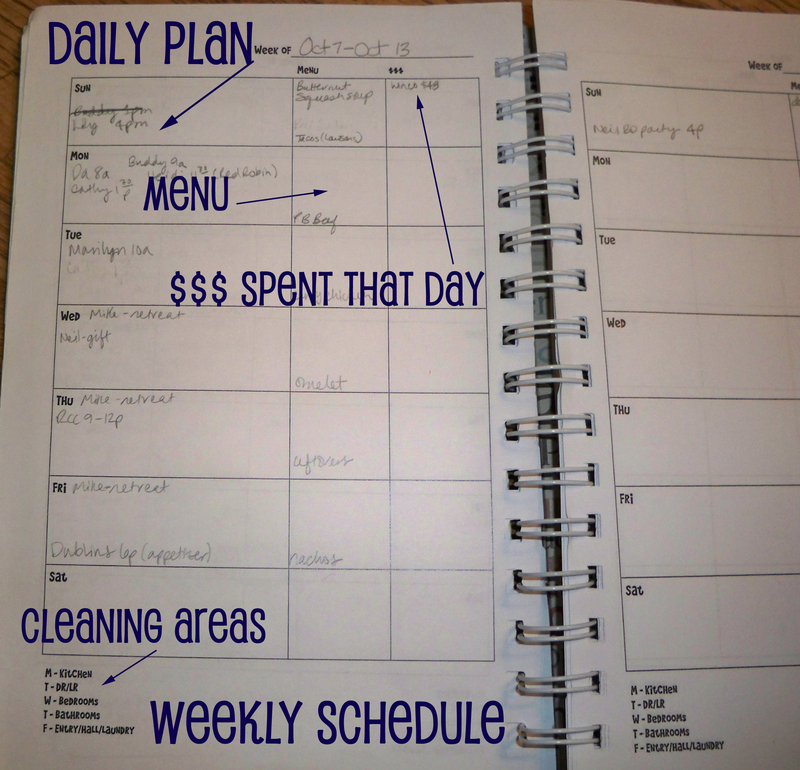 This entry was posted in 31 Days, Cleaning, Meal planning, Organization, Saving Money and tagged 31 Days, Change, Cleaning, meal planning, Organization, saving money. Bookmark the permalink. 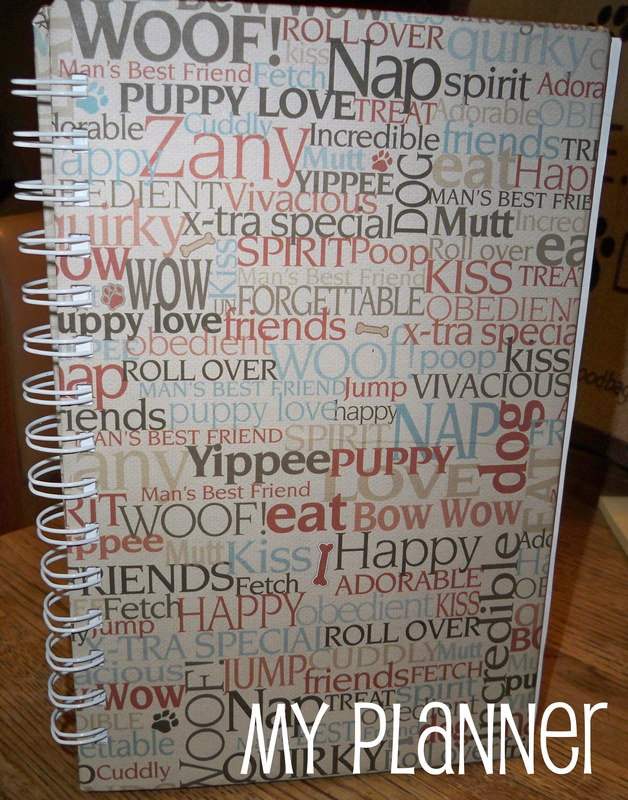 I am impressed that you were organized enough to make a planner. I have seen people create things and I think they are fantastic, I just can’t seem to make it to the creating part. =) And on a side note….I’m now craving nachos. Thanks Heidi. It was fun coming up with what I wanted/needed, but I know that it’s a work-in-process as well. I need to put as much energy into my obligations as I did to making my planner :-).